RoboUniverse, robotics’ annual meeting of the minds, is rolling out in New York City this week—and in the keynote address today, we learned where the best robotics work in the world is happening. What determined this list? Kara said that robot innovation centers all share proximity to “excellent universities,” and regularly contribute to robotics R&D. It’s also hard to deny each location’s contributions to robotics so far: Silicon Valley and Tokyo are gimmes, but not everyone might be aware of the others. Pittsburgh, for example, is not only home to Carnegie Mellon’s Robotics Institute, but also Uber’s new robotics lab focused on self-driving cars. 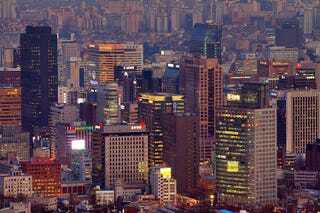 And Korea has emerged as a global force in the field, growing at warp-speeds of 21 percent annually. The country competes with nearby China and Japan (as well as America and Germany), rounding out the world’s top five biggest robot markets, according to today’s keynote. Some other up-and-coming regions to watch out for, according to the keynote, include Minneapolis, Detroit, greater Utah, Paris, Sweden, and Nagoya, Japan. The presentation also called into question New York City’s place (or lack thereof) on the list. Clearly we need more robots—maybe a few could take care of our bacteria-caked subway.